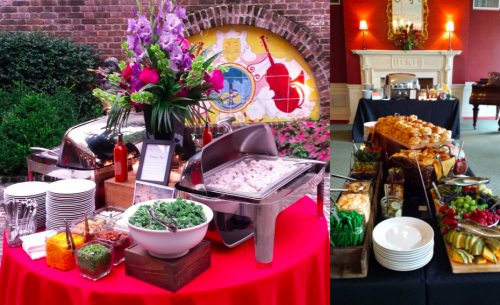 Salthouse Catering is thrilled to announce that we are working with Charleston Stage at Dock Street Theatre this season as their catering provider. Charleston Stage holds Director’s Circle the evening before opening night of each show. Director’s Circle is a reception offered to members, sponsors, donors and patrons of the theatre where attendees enjoy exclusive performances, have the opportunity to mingle with cast and crew members, and delight in delicious fare and cocktails. Most recently Salthouse catered the Director’s Circle reception to open for Hairspray, which is currently running at Dock Street Theatre. Guests were served Mepkin Abbey Mushroom Ravioli, House Smoked Salmon, Marinated Pork Loin, and Sweet Potato Salad. This is Salthouse’s second season as Charleston Stage’s catering partner and we could not be happier to be a part of the Director’s Circle Series again. For more information about this series visit the Director’s Circle blog, and be sure to visit the Dock Street Theatre Charleston Stage website to learn more about this season’s upcoming shows.